A few days before Christmas our beloved water dispenser broke. Someone turned the spigot a little too hard and it snapped off. To be fair, it was several years old and had survived a couple of hard falls to the floor. This dispenser is used in our kitchen/art area as a way for Nora and Gus to get water that they may need for things like cleaning, painting, washing hands, and washing dishes. With the madness of the holiday season, we haven't gotten around to replacing the water dispenser yet. But, it's presence is sorely missed. Gus, especially, is having a hard time with the loss of freedom. I have tried to keep a larger pitcher of water available, but it's just not as effective and often he has had to look to me when he wants to engage in water work. So, it's time to get serious about replacing the dispenser and getting everyone back to independent work. I've been looking around for some options and here's what I've found. OPTION 1: I like that this has a nice flat base, which our last one lacked (leading to more easy tipping). I also like the up and down motion of the spigot. It's not too expensive, and isn't too large. But, I really don't love the words on it. OPTION 2: I love the simplicity of the design, and the flat base. I love the wooden top (which our old dispenser had too. I don't love that it's so big. I think it holds more water (2G) than I'm comfortable putting out. I also don't love the colored spigot. OPTION 3: Again, love the clean design, but a little worried it would be easier to tip with the wider top. I wish it had the up and down spigot. But, holds a good amount of water. OPTION 4: I love the colors available here, and the simple design. It has the up/down spigot. But, way more expensive, holds a ton of water, and you have to order a lid separately. OPTION 5: Similar to option 4, this one is great because of the wide flat bottom and heavy ceramic. I love the design and spigot. BUT, no lid available. I think that could lead to grossness in the water, or play in the water container. OPTION 6: I love the design of this one, and the price. It doesn't hold too much water, and has a nice flat base. But, the spigot is side to side. I'm leaning toward option 6 right now, from IKEA. The side-to-side spigot is just a bit annoying since its more easily left on. But, that's what the old dispenser had so I know my kids can operate it. It's also a decent price where I wouldn't feel horrible if it broke. 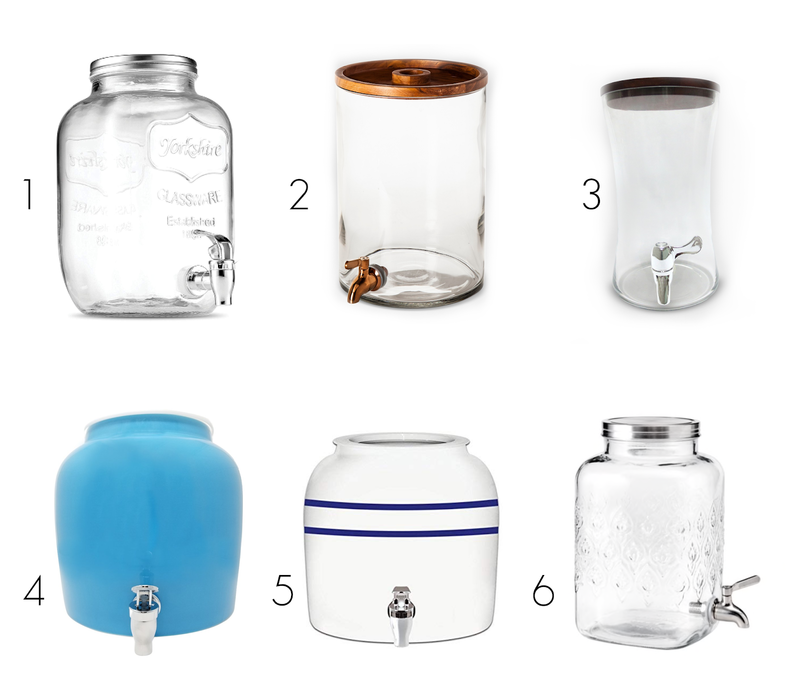 Do you have a water dispenser you like? Share it with me! We have option 1. I really like the spout - when my daughter was first using it, she could press to make water come out but it would stop when she released. Eventually, she figured out that she could push it up and the water would stay on. The main problem I’ve experienced is the inside of the metal lid is slowly showing rust spots from water condensation. I also used option 5 at work - we used it as a base for a large water jug although I recall it having a ceramic lid when needed. we currently have the plastic water dispenser that filters at the same time, is that recommended? or a different material would be best? Another option if you still have your old jug is that often you can simply replace the cheap plastic spigot and fit it with a sturdy metal one. We had this happen when my son was around 2 and we are still using the same jug 5 years later.